"It feels a bit a flat, doesn't it?" It was remarkable how often you heard that sentiment around the fringe meetings and bars at Labour's annual conference in Manchester this week, normally followed by an earnest discussion about why that should be. Had this not been an extraordinary week for Labour? Had they not elected a youthful new leader? Was the Blair/Brown era not now officially at an end? Well, yes to all that. But this was also Labour's first conference in opposition, after 13 years in power. And many of the men and women making speeches from the platform were not just shadow ministers, they were zombie ministers, simply going through the motions until they stand down or are replaced by new blood. It felt like there was a vacuum at the top too. If the new leader had been elected a month ago, this would have been a carefully choreographed, triumphant victory rally. There would have been new policies, a new team at the top, a new sense of direction. As it was, it all felt a bit raw and hastily assembled. The leadership election result suggests about half those present had wanted the older Miliband to be leader. Many of the fringe events had clearly been set up for the David Miliband party. Some of David's supporters, including Lord Mandelson, failed to show at their meetings. As did Ed, who had been booked to speak as the shadow energy and climate change secretary. There were no new policy announcements. Instead what we got was self-flagellation and soul-searching and a buoyant Lord Kinnock. 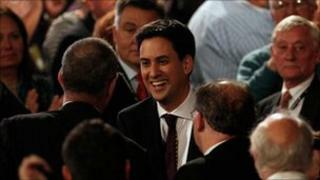 Ed had told the party to show "humility" in his debut leader's speech and they had clearly taken the message to heart. They had got it wrong on Iraq, they were too slow to pick up on concerns over immigration, they had been far too soft on the banks, they admitted. At one fringe meeting I went to a shadow minister, hoping for advancement under the new regime, seemed genuinely at a loss to explain what had gone wrong in his policy area when Labour were in government. At least they had tried, he concluded. Elsewhere, there was a sense that Labour was on the cusp of a major change of policy direction, on controversial issues such as tuition fees and Trident. At another fringe meeting Eric Joyce barracked Bob Ainsworth, the man he hopes to replace as shadow defence secretary, over Trident. Ed Miliband has promised Mr Joyce a major review of Labour's defence and foreign policy, the latter confided. There was genuine joy and excitement at Ed Miliband's election among some of the rank-and-file. His triumphant tour of the evening receptions on Sunday, while his brother did his best to appear supportive and keep out of the way, was greeted with real warmth by ordinary party members. They clearly feel Ed is one of their own. Lord Kinnock summed up the mood of many delegates on Tuesday evening with the phrase "we've got our party back" - a trade union delegate had said it to him during Ed's speech and he heartily endorsed the sentiment. It came at the start of an extraordinary speech from the former leader which took those present right back to the wild rhetorical flourishes and passion he was known for in the 1980s. The Tribune event at which Kinnock was speaking also heard from Ken Livingstone and Jack Dromey, the former party treasurer and union kingpin, who, like him, spoke of a return to the glory days of these left wing rallies which were once a highlight of the conference week. But it also heard from a new generation of Labour MPs - Ed Miliband's new generation - such as Chuka Umunna and Emily Thornberry. Lord Kinnock, he was on a roll this week, told the BBC's Daily Politics he too was part of Ed's "new generation". It did not matter that he was now 68. It was all about attitude, he explained. The unions too were in exultant mood, partying long into the night at the Midland Hotel and passing a series of motions, on reviewing privatisations and "progressive" taxation. The new leader's key message for the week was that the party had to change. That New Labour was dead. It was not quite clear whether he had convinced all those present in Manchester - but the task of has been made immeasurably easier by David's decision to depart the scene.